I have some thoughts on ramping down viruses in the body. I’d like to know if anyone has tried any of these and can let us know whether they do or don’t work? Please don’t hesitate to add comments about that. One of my general practitioners, a traditional medical doctor, once suggested using Nizoral anti-dandruff shampoo on the skin to ameliorate the look of eczema and psoriasis. The active ingredient in Nizoral 2% … ketoconazole … is an antifungal and anti-yeast medicine, so either eczema or psoriasis, or maybe both of them, must have a fungal flareup component. I’ve tried using Nizoral shampoo diluted with water, about 1 part Nizoral to 1 or 2 parts water, and find that it helps with eczema and psoriasis. My doctor was right. I found Nizoral shampoo itself to be hard on my skin unless I washed it right off again, right after I had put the diluted solution on the affected skin during a shower. For me, washing it right off again worked best. 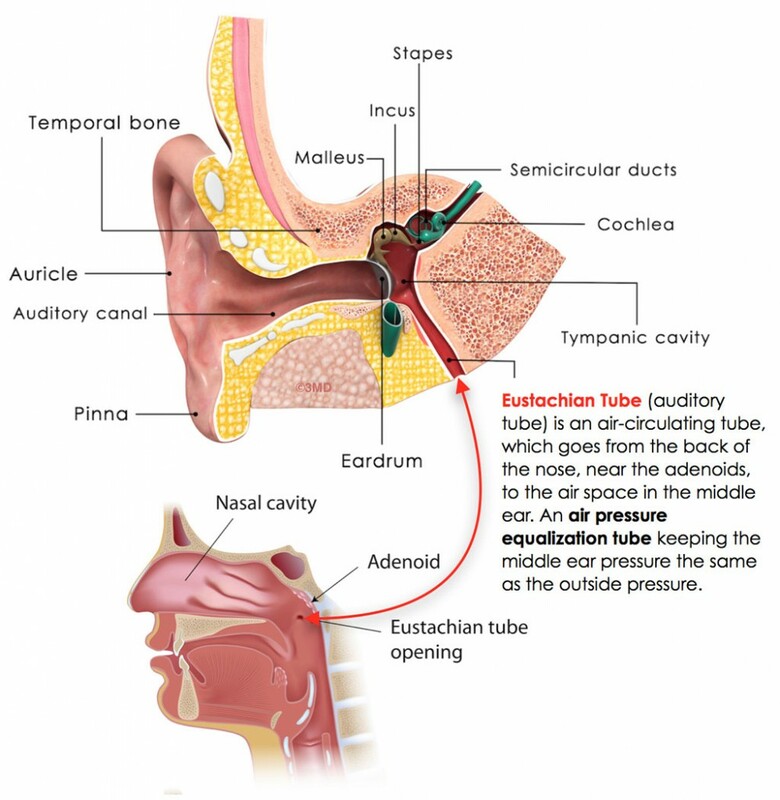 Image: Anatomy of the Eustachian tubes, one end of which connects to the back of the nasal cavity and the throat, and the other end of which connects to the tympanic cavity in the inner ear: http://entkidsadults.com/wp-content/uploads/2013/11/Eustachian-air-pressure-equalization-tube-999×1024.jpg .. Thus, I feel, it’s important to recognize psoriasis and eczema for what they are: Warning signs of overgrowth or ‘bloom’ of fungi inside (and not just on the surface of) the body, and to adjust the diet to quell and control this overgrowth. Avoiding eating sugar and complex carbohydrates when infected with flu (virus) led to death. Avoiding eating sugar and complex carbohydrates when infected with bacteria offered protection against death. Many bouts with flu have both a viral and a lesser bacterial infection component. If sputum (phlegm coughed up) is green or yellow, then there is a bacterial component. So then, would that mean, take a middle road on sugar and complex carb intake during such a combined illness? If sputum is white or clear, then there is a viral component. (2) So then, would that mean, avoid sugars and complex carbs during such an infection? I’ve noticed … again last night … that eating a teaspoon or two of honey before bed causes overstimulation of the cellular activity of the skin of the scalp. On the physical plane, the feeling I get is that of pressure on the top of the head, as if a weight shaped like a cap were pushing down on my head. I get this feeling when lying prostrate, but not while sitting up. On the astral plane, this is associated with overstimulation of the crown chakra (at the top of the head), overstimulation of the mental body, and bringing to awareness of negative thoughtforms stored in the aura. I feel this may have to do with hyperactivity of fungi in the skin of the scalp, and the intermixing of their emotional thoughtforms with our own. That makes it hard to get to sleep, and it also makes the interlude before sleep less than pleasant. Thus I suggest ingesting no sugars or honey after nightfall. It’s not really microbes that cause illness in the body; it’s the pH of the body that allows or prevents their proliferation. Apparently, acidic blood and acidic body cells are breeding grounds for viruses and bacteria. 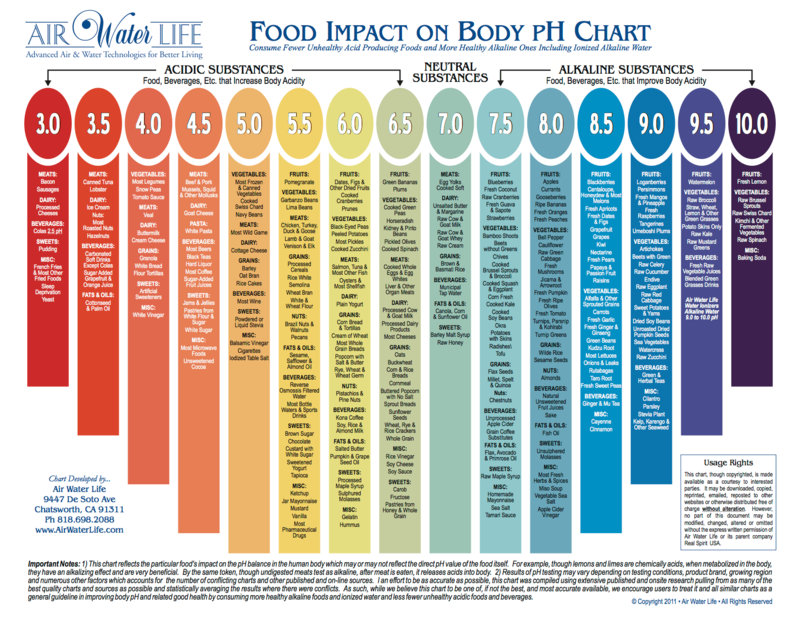 Link: Foods sorted by category and pH, https://i.pinimg.com/originals/5f/2d/e8/5f2de8db40b0ad14a50552363ed3f2a3.gif ..
Link: Foods sorted in horizontal rows, with each row showing foods at a certain pH: https://i.pinimg.com/736x/be/86/f0/be86f0972264ba21b75ead5da5b6824c–acidic-foods-acidic-food-chart.jpg ..
Link: Food Impact on Body pH Chart … a list with vertical rows, each row showing foods with a certain pH: https://trans4mind.com/nutrition/AirWaterLife-FoodImpactOnBody-pH-Chart.png .. I notice the above lists contradict some of the AARP literature I’ve read; one would have to approach the topic of what to eat experimentally, and item by item, I feel. For instance, is coffee life-extending, or is it bad for us because it’s acidic? That is one example. (1) Opposing Effects of Fasting Metabolism on Tissue Tolerance in Bacterial and Viral Inflammation. Wang A, Huen SC, Luan HH, Yu S, Zhang C, Gallezot JD, Booth CJ, Medzhitov R. Cell. 2016 Sep 8;166(6):1512-1525.e12. doi: 10.1016/j.cell.2016.07.026. https://www.ncbi.nlm.nih.gov/pubmed/27610573 ..
(2) “Green or yellow phlegm likely to be bacterial,” by Kerry Grens, 10 November 2011, https://www.reuters.com/article/us-phlegm/green-or-yellow-phlegm-likely-to-be-bacterial-idUSTRE7AA04M20111111 .. 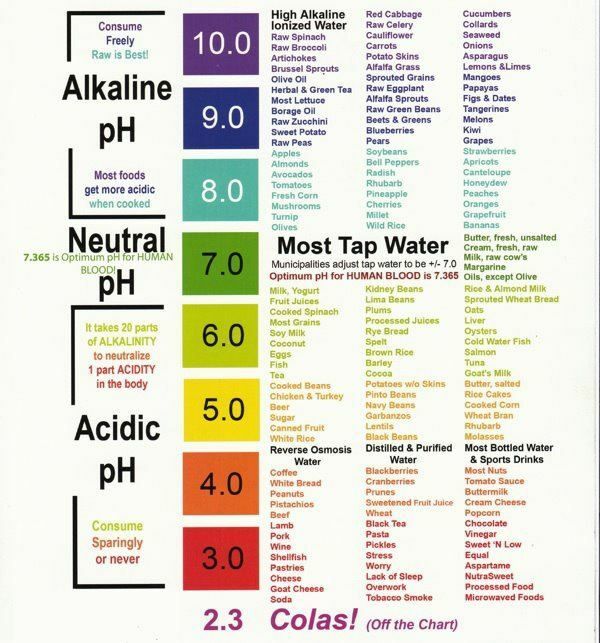 This entry was posted in 7th chakra - crown chakra, Bacteria, Biology - biochemistry - microbiology, Diet - herbs - extracts - aromatherapy, Fungi - yeasts, Health - healing, Microbiology, Sleep and tagged Bacteria, body pH, crown chakra, Diet - herbs - extracts - aromatherapy, disease, fungi, fungi in skin, healing, health, honey, insomnia, Ketoconazole, micro-organisms, microbes, Nizoral, nutrition, Sleep, sugars, viruses, yeasts on 20 November 2017 by Alice B. Clagett.